In collaboration with New Haven's Community Service Network (CSN) and the clinical forensic team at the Connecticut Mental Health Center (CMHC), Continuum’s Forensic Services serves individuals with psychiatric and co-occurring (mental illness and substance abuse) disorders in need of housing and community support. Forensic residents are moving through, and/or transitioning out of, the criminal justice system and client engagement often begins while these individuals are still incarcerated. Residents have access to case management – providing linkage with psychiatric, medical, and clinical services – and to supports through their participation in the community and recovery-based programs. In addition, Continuum's Housing Resource Coordination Program assists residents with securing and maintaining housing. Individuals who agree to participate and invest in these services can, via our “graduating” programs, successfully transition to independent community living while maintaining their clinical and community supports. Our model is recovery-based, client-centered, and individualized based upon the needs and goals of persons served. The CORP program supports the reentry housing and daily living needs of persons returning to the Greater New Haven community after extended periods of incarceration. This supervised residential program is often the first transitional residence for individuals leaving a Department of Corrections facility. In addition to providing housing, food, and daily living fundamentals, the staff’s primary goal is to provide a structured environment from which linkages to psychiatric and clinical services and substance abuse treatments can be established. Referrals are made via CMHC's forensic team. ASIST supports the short-term housing and daily living needs of persons requiring judicial supervision alongside mental health and substance abuse services. The program offers intervention-based supports to enable clients to engage (or reengage) in mental health treatment and recovery-based programs. With the goals of jail diversion and successful independent living, case management provides structure and support in a supervised residential program setting. Referrals are made via CMHC's forensic team. The Jail Diversion program operates as an alternative to incarceration while participants are awaiting judicial disposition. This service is designed for persons with mental illness who could decompensate without support. The Jail Diversion program provides 100 days per year of access to an overflow respite bed and its ervices are similar to that of the Respite program. Individuals referred to this program are simultaneously referred for outpatient services at CMHC as they await disposition of their court case, and are only considered for admission if their court case involves non-violent crimes. A Common Bond, a collaboration between the Department of Mental Health and Addiction Services and the Department of Corrections, provides community-based transitional housing for individuals with serious mental illness exiting long-term hospitalization in a state forensic hospital or incarceration. ACB offers psycho-social groups, peer support, and assistance with the challenge of social reintegration into the community. Transportation is also available for all psychiatric, legal, and medical appointments. ELP IV supports the transitional housing and daily living needs of persons with co-occurring disorder histories — most of whom have already participated in our shorter-term forensic programs — who have had incidents and challenges related to the criminal justice system. 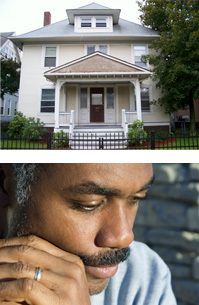 For up to 2 years, clients reside in a 3-family home with recovery and skill-building at its foundation. Program guidelines provide a framework for clients to build on and create new supports in their own lives, while staff and program supports allow for clients' guidance and safety. Referrals are made via CMHC's forensic team and CSN. The FSH scattered-site program provides case management services and community and recovery supports to persons living independently in the Greater New Haven community. Most clients served have "graduated" to this program after having participated in one or more of Continuum's other forensic/transitional programs designed to help prepare clients to successfully move into and maintain their own independent housing in the community. Continuum's case management services focus not only on clients' immediate needs and continued participation services, but also help clients formulate and shape their longer-term goals. Referrals are made via CMHC's forensic team and the CSN.